The United Nations Security Council (UNSC) has unanimously moved to oversee the Syrian ceasefire in two separate resolutions since 14 April, but continued reports of violations by Syrian security forces and attacks by the opposition have called into question the sustainability of the fragile six-point peace plan of joint United Nations-League of Arab States Special Envoy Kofi Annan. Adopting Resolution 2042 on 14 April, all members of the Council agreed to dispatch an advance team of up to 30 unarmed United Nations monitors to assess whether the Syrian government and the opposition were respecting the ceasefire. And while Syrian Ambassador to the UN, Bashar Ja’afari, said his country would “spare no expense” to ensure the success of the Annan plan, violence escalated a day after the Council’s decision was made, with Syrian forces and heavy weaponry remaining in cities across the country. Amnesty International called the passing of the resolution positive, but underwhelming, noting the constant breach of trust by the Syrian government. 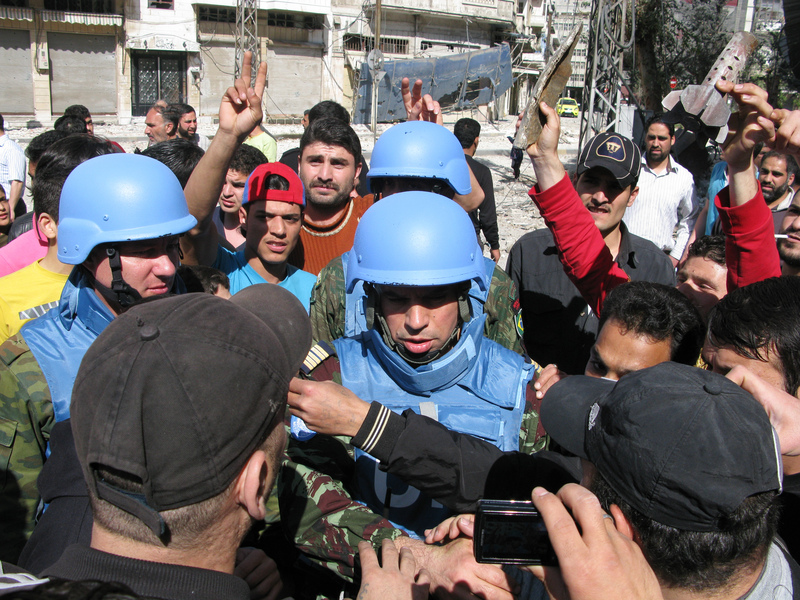 By 19 April, with reports of ceasefire violations by the government nearly every day, UN Secretary-General Ban Ki-moon stated that the Syrian government had failed to adhere to the ceasefire plan, and that, “there has been no meaningful progress on the ground.” Attempting to salvage Annan’s peace plan and ensure greater implementation on the ground in Syria, the Secretary-General proposed an expansion of the monitoring mission mandated by Resolution 2042 of up to 300 unarmed monitors, and the establishment of a new mission, the United Nations Support Mission in Syria (UNSMIS). 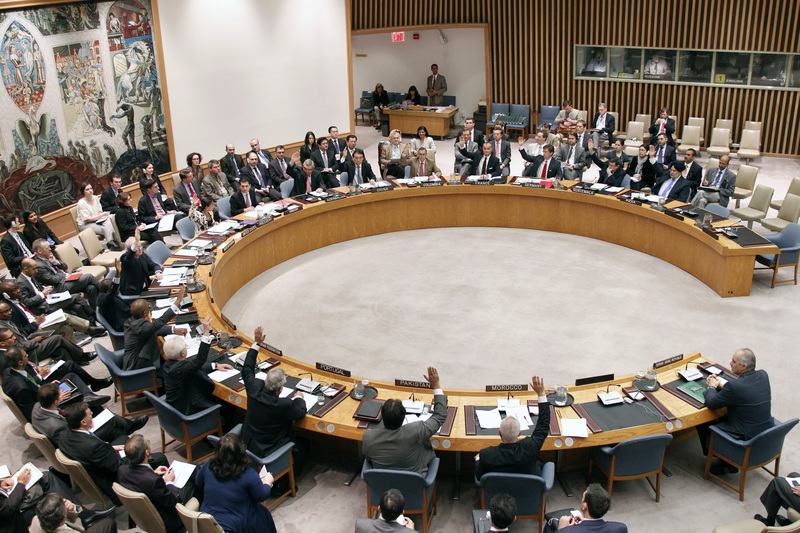 Developments followed quickly at the Security Council, with the 15-member body unanimously endorsing the expansion of the monitoring mission to 300 unarmed observers with Resolution 2043 on 21 April. In an interesting turn of events, it was the Russian delegation – which has twice vetoed Security Council action on Syria (on 4 October 2011 and 4 February 2012), as well as voted against a General Assembly resolution – that circulated the Resolution, which calls for the expeditious deployment of the monitors, unimpeded access for them, cooperation between the UN and Syria to provide for air transportation assets, and the ability of the monitors to communicate with individuals without retaliation against those individuals. Reports of government-perpetrated violence in Homs and Damascus continued to emerge immediately after the passing of Resolution 2043, leading UN officials to call for a full cessation of violence and Security Council Members to urge the rapid deployment of more monitors to the country on 24 April. Ten days after the advanced observer team was mandated by the Council, only 11 monitors were active in the country. Ahmad Fawzi, the spokesperson for Kofi Annan, said on 27 April that the full advance team of 30 monitors would be deployed by Monday, 30 April, but Syrian activists have expressed concerns with the slow deployment process. The mission also faces complications on the ground as a result of Syria’s lack of cooperation and non-compliance. The Syrian government has reportedly refused to allow any monitors that are nationals of any of the countries in the 14-member “Friends of Syria” group, and a government spokesperson also stated on 15 April that it would need to be involved in “all steps on the ground” by UN monitors, raising concerns over the ability of the monitors to have unhindered access in the country. Recent reports suggest that a game of cat and mouse has ensued in Syria between security forces and the UN monitors, with gunfire and shelling by government security forces occurring immediately after the observers toured cities like Homs and Hama, which have seen some of the most destructive violence by government mortar fire. On 25 April, Special Envoy Annan called the recent flares of violence “unacceptable and reprehensible”, and confirmed that the Syrian government has still yet to withdraw troops and heavy weapons from major cities and towns. This was echoed by the Secretary-General on 26 April, who expressed his alarm at continued attacks by government forces against civilian populations and demanded Bashar al-Assad, Syria’s President, comply with the ceasefire. A day later, the Secretary-General appointed Norwegian General Robert Mood as head of UNSMIS, who urged for “help and cooperation” by all sides to end the violence. As violence in Syria continues, including devastating explosions in Hama and deadly blasts in Idlib, and hopes falter for the successful implementation of Annan’s peace plan, Western and Arab countries have begun to talk of the need for contingency planning if the Assad government does not cease attacks and withdraw troops and heavy weaponry from cities. At the Friends of Syria meeting on 19 April, US Secretary of State Hillary Clinton called for the imposition of an arms embargo, as well as stricter sanctions against the country to ensure Syrian compliance with Annan’s six-point plan. On 25 April France’s Foreign Minister, Alain Juppé, also stressed the need for contingency planning, stating that Paris would be pushing for a Chapter VII resolution at the Council, which could include punitive sanctions against the Assad regime, if Syria did not fully implement the peace plan by May. The Arab League has also stated on 26 April that it will call on the UN Security Council to take “immediate action to protect Syrian civilians” at an upcoming Council meeting, with Nabil el-Araby, the League’s Secretary General, stressing the need to rapidly deploy the full monitoring force to Syria. The deployment of monitors by international and regional organizations is one of the many tools available to the international community under the third pillar of the Responsibility to Protect framework. If such missions receive the cooperation of the host government of the country in which they are deployed, as well as the requisite capabilities and support from the international community, they can investigate and report on violations, which may effectively deter attacks against civilians in the context of a ceasefire between armed belligerents. If, however, the threat or commission of mass atrocities in the context of a country-specific situation continues in spite of a deployment of monitors, the third pillar of the RtoP provides for a range of diplomatic, economic, legal, and military measures that national, regional, and international actors can implement to stem such atrocities. Proactively assessing the effectiveness of measures employed to protect civilians, as well as contingency planning in the wake of the failure of such measures, is thus critical in responding to situations of ongoing mass crimes. Such planning does not mean that a particular measure will be written off, or that another will be favoured as a course of action moving forward. Instead, it indicates that the international community is prepared to mobilize the necessary will and resources to effectively respond to massive human rights violations in a flexible, timely manner.